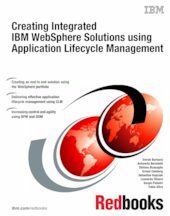 This IBM® Redbooks® publication demonstrates, through a practical solution and step-by-step implementation instructions, how customers can use the IBM Rational® Application Lifecycle Management (ALM) portfolio to build and manage an integrated IBM WebSphere® Application. Building a business application (mobile and desktop) that uses WebSphere Application Server, IBM MQ, IBM Integration Bus (IIB), Business Process Management (BPM), Operational Decision Management (ODM), and Mobile. IBM Redpaper™ publication, Rapid deployment of integrated WebSphere solutions in your cloud, REDP-5132, is an extension to this IBM Redbooks publication. Using the same practical solution covered in this Redbooks publication, REDP-5132 demonstrates how the IBM PureApplication® System is a "logical extension" versus a "whole new world", covering PureApplication Patterns and the new PureApplication as a service on Softlayer. The intended audience for this book is architects, developers, administrators, and DevOps personnel.